Alder Smoked Tuna for sale. Buy online at Zingerman's Mail Order. Gourmet Gifts. Food Gifts. I absolutely love Ortiz's line-caught bonita tuna from Spain and it's the only tuna we've sold for well over a decade. Any new tuna that butts in must be something special. This one is. The fishermen for Island Trollers have been line-catching albacore tuna in the northern Pacific for nearly fifty years. 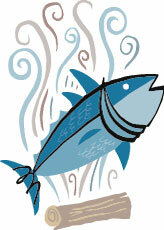 The tuna is smoked over red alder then cooked in its own juices. This wood smoke gives the tuna a slight sweetness and brings out the depth and rich flavors of the fish instead of masking it. This can stand up to a bit of mayo for a stellar tuna salad sandwich.